Design it! Print it! Build it! Make the buildings you cannot buy. 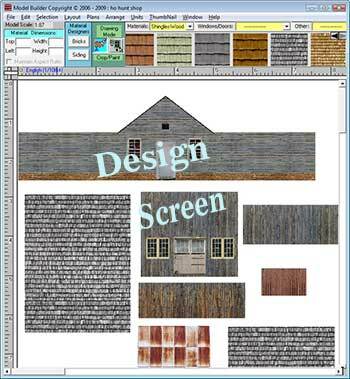 Use our paper building software to inexpensively add hundreds of buildings to your layout. For less than the cost of a single typical model train building, Model Builder is the one program you need. Use the 6 projects in our included Project Idea Booklet, start with the included sample buildings, download some building ideas from our new Model Builder Sharing website just start building your structures using the 500 included textures in 34 categories. Design industrial buildings, residences, apartment buildings, track side depots, many other track side structures, your own ideas. Print realistic buildings or backdrops for your model train layout, diorama, war games, and many other miniature scenes..
System Requirements: 280MB Hard disc space, minimum 1Gb Ram. Purchase comes with 2 years of free support. We print all of our paper model designs with an ordinary $70 Inkjet Printer, Epson Photo printers are nice for detail. We recommend Matte Photo Paper for best image quality. "Have had your program for a number of years. Enjoy it`s features immensely." "it is excellent and pays for itself over and over again and I will certainly recommend it to any fellow modeler"
"When I saw the quality of your sample product online I knew I needed to get the complete Model Builder Software. You have been able to capture the realism of buildings and other items required to make the layout complete. Great Job!!!" "Great, What I was always looking for, A dream come true"
"I wish I had found this program sooner!!" "Awesome Product!!!!!!!!!!!!!!!!!!!!!! With a little effort you can build outstanding structures for your RR." "Guys, just like to say what an excellent product. It is the most useful piece of software I have bought. Simple to use, great selection of ready to go clip art and will be using it for years to come. Keep up the good work." "I just recently ordered your program and have been designing buildings most of the day." "Your concept and software will enable me, who lives only on social security, to have more buildings, etc., than I could ever have, including some factories, etc. " "love it! Congratulations on fabulous software!"